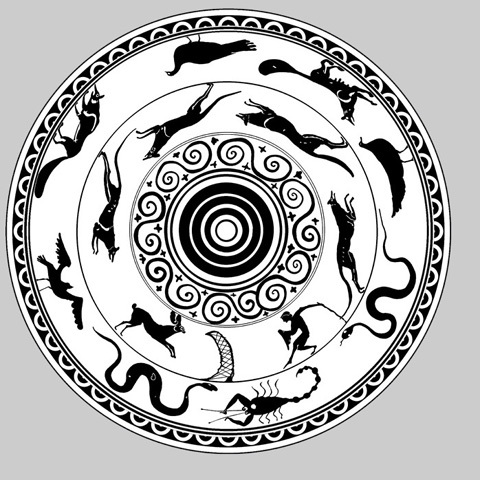 These are the images on a sixth century BC bowl attributed to the workshop of Nikosthenes and now in the British Museum. It has been suggested that the inner register shows Orion hunting a hare (Lepus) accompanied by his dogs (Canis major and minor). However, nobody has followed this reasoning through and concluded that the outer register also shows a selection of animal constellations. These include a dog fox and a vixen, led in a circular dance by a scorpion playing a set of double reed pipes. This is a reference to the circular dance of the stars, and the start of the Attic year which began with the appearance of Sirius and the summer constellation of Scorpio. The fox and the hare feature in the iconography of the Greek God Dionysos, most notably in this image on a panel amphora by the Amasis Painter in the Staaltliche Antikensammlung in Munich. There were many sects of Dionysian worshippers throughout the Greek world and its periphery. One of the most notable of these was the Thracian Bassarids who dressed exclusively in fox-skin clothing. In a fragment of Aeschylus' lost play The Edonians Dionysos himself is described as wearing a long cloak of fox fur. In late Roman mosaics Dionysos' rival, the Thracian Orpheus, is shown singing and playing his lyre to the animals. The fox features among these and is some­times the only one present. The fox also appears in the myth of the Teumessian Vixen which was sent by Dionysos as a curse on the city of Thebes. All these stories can only be understood properly in the context of astral mythology.